2/11/11 EDITED TO ADD: It's finished! 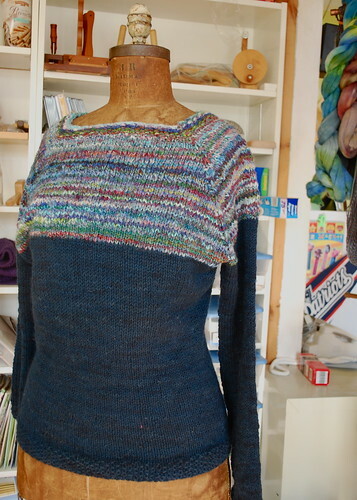 I am really liking this sweater - basically I used the pattern "Faux Fair Isle Raglans" from Shannon Okey's book Spin to Knit: the Knitter's Guide to Yarn Making, but I added underarm gussets, and I think I added short-rows on the back of the neck so it would not ride up.... I'll have to double-check that bit! Also - I dyed up four 4 oz chunks of roving, again the beautiful Cormo from Juniper Moon Farm- the first brownish grey was sort of a voo-do dyejob. I piled up the soaked fiber and randomly poured mixed red, blue and yellow dyes. This one I love! I painted two of the rovings the same and they are most juicy! 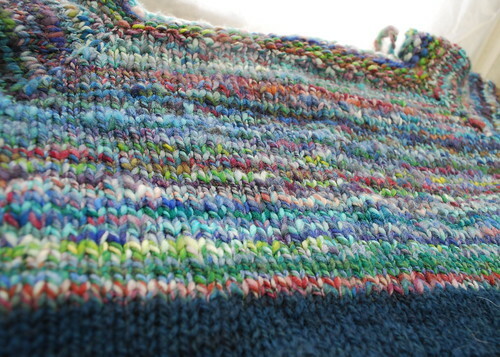 Your dyeing is really pretty, Lisa, and I adore the sweater. Be-utiful!!! I'd LOVE to get my hands (and my wheel!) on those dyed rovings, especially the...wait...I can't choose!